Overseas roadshow for the IAPH Guangzhou 2019 World Ports Conference was successfully held in Armourer's Hall, London, UK on September 20th. Ms. Yuan Yue, Deputy Director General of Guangzhou Port Authority, met with over 100 senior representatives from British ports, ship-owners, commodity traders, shipping & service companies, shipping public policy research institutes, and other representatives from the port and shipping industry. In her keynote speech, Ms. Yuan Yue said, “Guangzhou is the gateway city of South China and is known as the “Millennium Business Capital” and a popular destination for business and investment. At present, Guangzhou has attracted investors from over 130 countries. Nearly 300 of the world's top 500 companies have businesses and investment in Guangzhou. Guangzhou Port is a comprehensive coastal hub port and a key container terminal of China, which opened more than 200 container routes to countries around the world, established seaborne trade relations with 400 ports from 100 countries and regions around the world." Yuan Yue said that openness, sharing and cooperation have always been the concept advocated by Guangzhou Port. Towards 2019, Guangzhou Port is ready to welcome the representatives from international ports all over the world. “The UK attaches great importance to the development of business relations with China, especially in the trade sector." 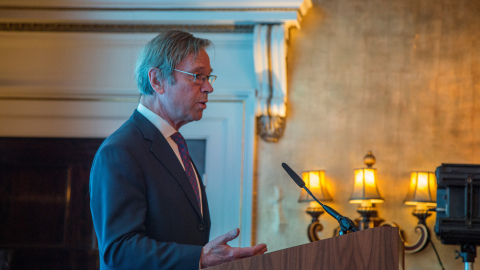 Lord Jeffrey Evans, Chairman of Maritime London said in a welcome speech that "Guangzhou, as China's prestigious trading port, is one of the earliest gateways for the international shipping and trade industry to enter the Chinese market. With the development for the further open-up of China’s financial market, Guangzhou become more of international appeal." “In spite of the challenges and twists and turns of global free trade, Guangzhou Port keeps a steadily fast growth in terms of container, oil transportation, grains, Ro-Ro vehicles and other fields, which is quite impressive.” Nigel Richardson, president of EA Gibson, a famous British shipping brokerage company said in his speech, “We noticed about the exciting development of Guangdong-Hong Kong-Macao Greater Bay Area, and the positive leadership of Guangzhou, which allows us to see the infinite business opportunities. We wish to establish a diversified relationship, more professional shipping services, and more cutting-edge shipping liner routes with Guangzhou Port." “Congratulations to Guangzhou Port for being chosen as the host for the IAPH 2019 World Ports Conference, which is indeed a great achievement!” said Ian Gaunt, President of the London Maritime Arbitration Association. “With the increasing internationalization of Guangzhou Port, dispute resolution involving international business partners will become more and more important. Members of the London Maritime Arbitration Association have long had extensive experience in arbitration business involving China. We look forward to a further cooperation with Guangzhou Port and a more binding shipping business networks."